The W-43 Press Release Photo with the 4-valve head in the upper left inset. The engine generated 525-550 HP on pump gas in street trim. Unfortunately, there was never the expected announcement. Sometimes circumstances start something in motion, and then, just when they're about to turn the world upside down, another thing blows the game changer into oblivion. Such was the case back in the early-sixties, when Oldsmobile got the green light to build the Toronado. What the impact of the Toronado had on Oldsmobile was far more than just an industry-changing viewpoint on front wheel drive - it gave Olds engineering the prestige to once again, like in 1949, to be a leader in innovation. The second part of the equation was that John Beltz, the lead on the Toronado project, received the promotion to Division President. What the powers that be in GM didn't expect was that John was a performance nut - and as happened in the 60s with the GTO - suddenly performance sold cars! John enthusiastically approved Engineering's ideas for the 442, championed the abolition of the 400 CID limit on the mid-size cars (he winked at the Hurst/Olds), allowed Oldsmobile to get involved in Can-Am racing, and authorized the investigation into a all-out street performance 455. Thus, we have the W-43 - a 4-valve, pent roof pushrod crazy business street engine, that but for GM's complete abandonment of performance in lieu of emissions control, was ready to hit the streets in 1971. And, even when there still was a chance that could have happened, John became ill from cancer and subsequentially passed away. In the late 60's and early 70's, when cubic inches and horsepower ratings in excess of 400 ruled the day, the factories were always trying to wring more from their existing pieces. The practice was to get an efficient engine and then increase the displacement when more power and torque was needed. But engines still seemed to have a practical limit of about 500 cubic inches. By 1968 the factories had hit that wall, with all manufacturers settling at about 440-460 cubic inches as practical for a passenger car engine. Most street pieces could reach about one horse per cubic inch with existing OHV setups and a good camshaft and carburetors. More horsepower was available, but it required radical camshaft timing and induction systems that were not truly compatible for street use. They made impressive HP, but they were not a car one could drive on a daily basis. So what do you do after hotter cams and more carbs can't get any more tractable horsepower? Oldsmobile's response was valves - 4 of 'em. Olds engineers had been one of the first to install a flow bench at experimental engineering. Going back to the early 60s, they had studied airflow and combustion chamber configuration - way before anyone else was even thinking about it. 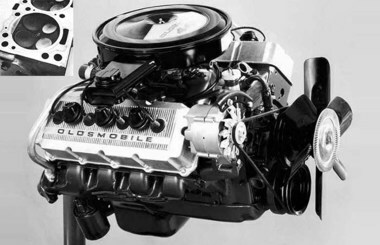 It is a little known fact that the reason why the stock Olds V8 engine survived so long in the GM lineup is because their combustion chamber was the only one that could meet emissions requirements without port fuel injection - hence all those carbureted 307s hanging on for as long as they did. to view these stories. Click HERE to log in. OR Click HERE to join.